Fender Deluxe Model 5B3 Model Tube Amplifier (1952), made in Fullerton, California, serial # 6465, tweed fabric covering finish. Height is 16 1/4 in. (41.3 cm. ), 18 in. (45.7 cm.) width, and 8 5/8 in. (21.9 cm.) deep. 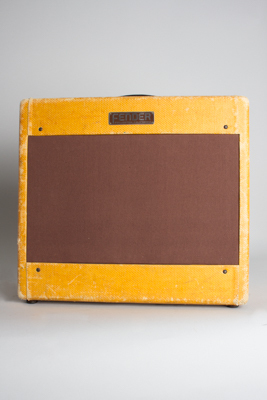 This is a fairly early example of a wide-panel tweed Deluxe, one of Fender's all-time classic amplifiers. The amp has seen some fairly heavy use (and been close to a fire by the loks of it!) but has survived sounding great.The tube chart carries the serial number but no date code, as Fender did not begin stamping a 2-letter code signifying the production date there until 1953. The original Jensen speaker dates to the 22nd week of 1952 and visible pot code is 304-219. Externally the tweed shows a decent amount of wear and staining mostly to the sides and edges, and a large burn to the back panel that does not seem to be related to any internal emergency. The control panel has some light corrosion and loss but is cleaner than many. The amp has had some typical service repairs. The only major modifications are the amp has a newer Power Transformer of unknown spec. and the cord is a new 3-prong. Internally it shows replaced coupling caps (part of typical maintenance cap job) and two replaced power resistors. The tubes are a mix of old and NOS octal preamp tubes and glass power tubes. This amp sounds fantastic, with a lot of clarity at lower volumes but it really roars when pushed. Very Good + Condition.